Hi. 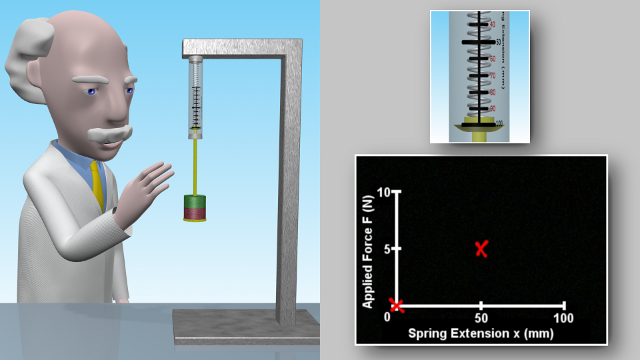 Here is an image from my new video, which I’m currently developing, which explains the use of a spring balance to measure force. You can see from the image that the new video will have a split screen format, which shows me as I add and remove masses from the spring balance as well as a close up view of the spring balance scale and a plot of the results of the experiment. From this we will calculate the spring constant for the spring. Thanks for the first two videos on Newton’s Laws. They were a great help explaining motion to my son. We hope to see the video for the third law soon. I’m pleased you found the videos helpful. I am a retired Physics & Chemistry Teacher & I have enjoyed your physics animations on Newton’s first 2 laws. I am looking forward to the video animation of his 3rd law, which I was unable to find. How many animations have you completed & where may I find them? I discovered your animations on YouTube. Thanks for your comments. I have only produced two videos to date and they may be found on my channel at YouTube . I will be producing a video on the third law in the near future.